The weather’s been getting warmer and sunnier here in Berlin. 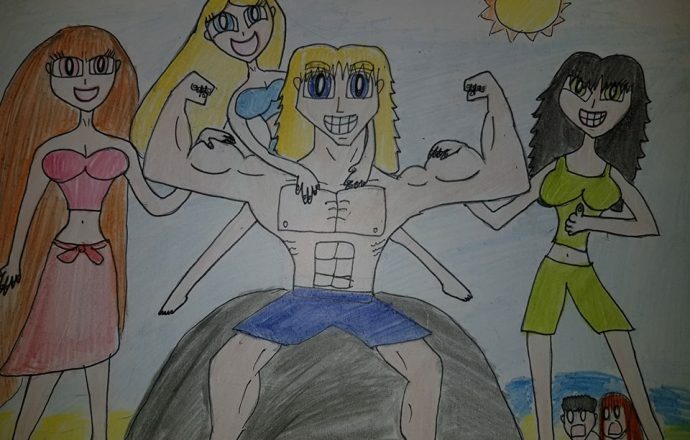 And for that, here’s my most beloved Rowdyruff of all time, Boomer on the beach, being the lovable, adorable, muscular dude that he is. Joining him are his most favorite young ladies of all time, Blossom, Bubbles, and Buttercup. Blossom is rather fascinated by the size of Boomer’s left bicep and is astounded at his peak physical strength. Bubbles just loves having her beau around and, as the Joy and the Laughter of this superhuman group, she is so happy to have a wonderful, loving, caring, muscular young man like her darling Boomie in her happy life. Buttercup is rather impressed at how much muscle Boomer has and gives him a thumbs up. Meanwhile, Brick and Butch are in the background, as they are astonished of how their youngest brother can obtain a lot of attention from these babes. 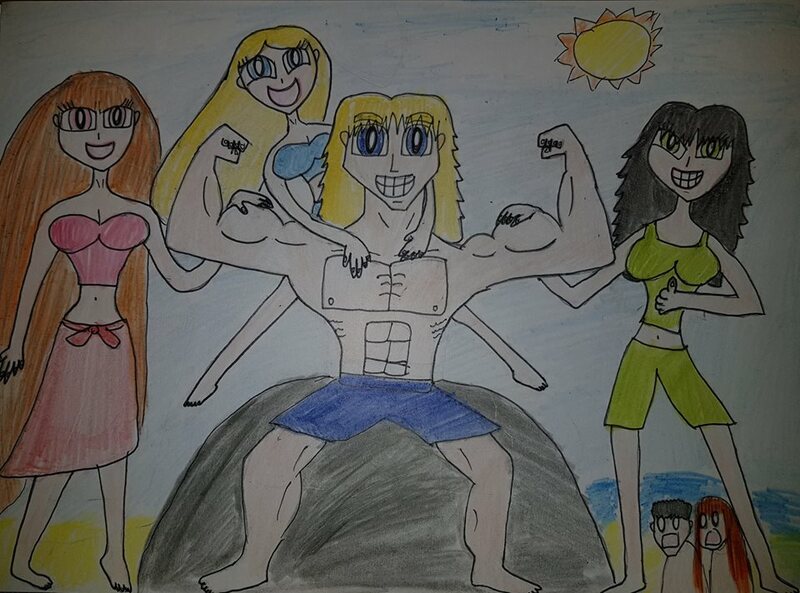 This piece of fanart is dedicated to all of the shippers of Blossoomer, Boomubbles, and Boomercup. So, I hope you all enjoy. As I stated before, I do fancy Blossoomer because of how endearing and sweet it is, as Boomer and Blossom seem to have a relationship based on trust, empathy, kindness, and healthy synergy. Mostly because this pairing has the simple yet sweet dumb muscle of a boy in the form of Boomer having a grand time with the articulate and diplomatic intellectual of a girl in the form of Blossom, which in turn makes this pairing plausible. I kind of like Boomercup because of the gentle giant and feisty tsundere who wears the pants in this relationship type of dynamic. This pairing is rather entertaining and kind of fun because of how these two seem to click. Finally, there’s my OTP Boomubbles. I don’t need to explain any further why I love this pairing, but for those of you not in the know what I think of it, I think it’s best and healthiest of the RRBxPPG pairings. The Blues have the sweetest, most endearing, and most lovely chemistry. Just their mere presence alone is enough to make me warm and fuzzy inside. Well, thank you for taking the time to have a gander at this piece of fanart and I wish you more lovely, sunny days to come. Boomer, Blossom, Buttercup, Bubbles, Brick, and Butch from The Powerpuff Girls belong to Craig McCracken.